The three most common causes of death in children are preventable. Scientists don’t have to predict when human pollution and catastrophic climate changes will start killing humans—it already has. Even more alarming is that it’s killing children. 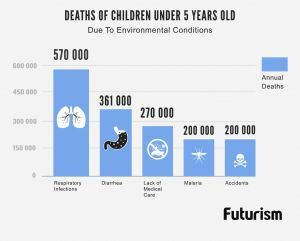 According to the World Health Organization, a quarter of all global deaths of children below five years old are caused by polluted environments. “A polluted environment is a deadly one — particularly for young children. Their developing organs and immune systems, and smaller bodies and airways, make them especially vulnerable to dirty air and water,” said WHO director-general Margaret Chan in a statement. 570,000 children die from respiratory infections like pneumonia, which can be caused by indoor and outdoor pollution, as well as second-hand smoke. 361,000 kids die because of diarrhea, typically caused by unsafe drinking water, unsanitary environments, and lack of hygiene. 270,000 children die in their first month because of conditions that could have been prevented if they were given access to clean water and protected them from air pollution. 200,000 deaths caused by malaria could have been prevented if clean water was available to reduce breeding sites of mosquitoes. 200,000 children lose their life because of environmental injuries such as poisoning, falls, and drowning. The WHO also notes the importance of properly managing emerging environmental hazards like electronic and electrical waste. Without proper recycling, this can lead to children being exposed to dangerous toxins known to harm intellectual development and cause attention deficits, as well as more serious conditions like lung disease and cancer. Constant exposure to chemicals like fluoride and lead — which can be found in water, paint, pesticides, and even our food — can affect a child’s brain development and cause a slew of health problems. Because of climate change, we can expect temperatures and carbon dioxide levels to continue rising, which supports pollen growth. Add that to air pollution and secondhand tobacco smoke, and it could raise the incidence of asthma in children. An increased risk of diarrhea and pneumonia is also expected in communities that are dependent on coal or other unclean fossil fuels for cooking and heat. These cases can prove to be fatal, and could also increase a child’s lifelong risk of heart disease, stroke, and cancer. The report outlines the real cost of a polluted environment—the lives 1.7 million children. Clearly, a concerted effort to ensure that they are protected from these environmental hazards is needed. Global initiatives for improving water quality and moving us away from fossil fuels will not only protect our environment, it will also save children’s lives.